Red Wine and Resvei atiol: Good for yon heart? Has your youthful energy faded? Concerned about health risks associated with aging? Are you feeling older, and wondering what to do about it? If you answered “yes” to any of these questions, ResveraMD can help. ResveraMD combines the clinically proven power of resveratrol with four other sources of antioxidants to help you feel younger and more energetic than ever before. You've probably heard about resveratrol, "the biggest medical discovery since antibiotics" (a quote from a Harvard University study). But you might not know the full range of the amazing benefits resveratrol offers. Resveratrol activates the SIRT1 gene, the body's survival mechanism, that extends life in low-energy environments. In the past, SIRT1 has only been activated by extreme caloric restriction (and starvation). Research has proven that resveratrol activates this crucial gene, resulting in increased fat oxidation and a dramatically longer lifespan. Remember, this is science. These claims are backed up by dozens of clinical studies. This list of benefits sounds incredible, but every one of them is backed up by clinical and medical research. All of the following prestigious publications have released studies on the benefits of resveratrol: the National Academy of Sciences, the journal Science, Nature, Lancet, and virtually every other academic journal. Researchers have documented the antiaging actions of resveratrol and further studies are being performed right now. But you don't have to wait to experience the rejuvenating effects of resveratrol. Resveratrol actually protects your body from the stresses of aging. 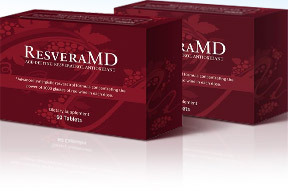 In addition, resveratrol helps to reverse damage already done by aging and daily life in a toxic environment. So you don't have to be concerned with aging to experience the incredible quality-of-life enhancements of resveratrol! Because the ResveraMD formula contains additional antioxidants, this formula is more powerful than any other product on the market today. Are you ready to benefit from "the biggest medical discovery since antibiotics"? Try ResveraMD today!